• Rest of the World 50 index (including Opus One and Dominus) is up by 2.62% over the past 12 months. • Only Penfolds and Vega Sicilia are in the top 100. With the Power 100 being such a French affair, brands from elsewhere have to be truly heavy hitters to qualify. As such, only Penfolds and Vega Sicilia have managed so far from the Rest of the World category, but the overall increase in value trading of 5% to 7% shows more of the wines are changing hands. Penfolds is largely driven by Grange, for which there are half-decent volumes. Labels such as Bin 707 is tightly allocated, and very little makes its way to the secondary market. Vega Sicilia continues to be the sole Spanish label of any note in the secondary market, helped by Unico. It went from 77th to 43rd. Pingus and La Rioja Alta both regressed, however, Spain’s perennial problem being that the wines are still too good value for their own good and they, “don’t let collectors finance it”, says Gibbs, referring to the fact the wines are released when they are ready to drink. Outside of the Power 100, Clarendon Hills and Torbreck were on the move, as was Almaviva, which rose up by 71 places to 133rd. As a brand, Almaviva has only really come into focus since 2016, but this year it has risen by 28% in price, making it one of the better performers. The owners – Baron Philippe de Rothschild and Viña Concha y Toro – want it to be ranked among the world’s best, and maybe that’s happening. 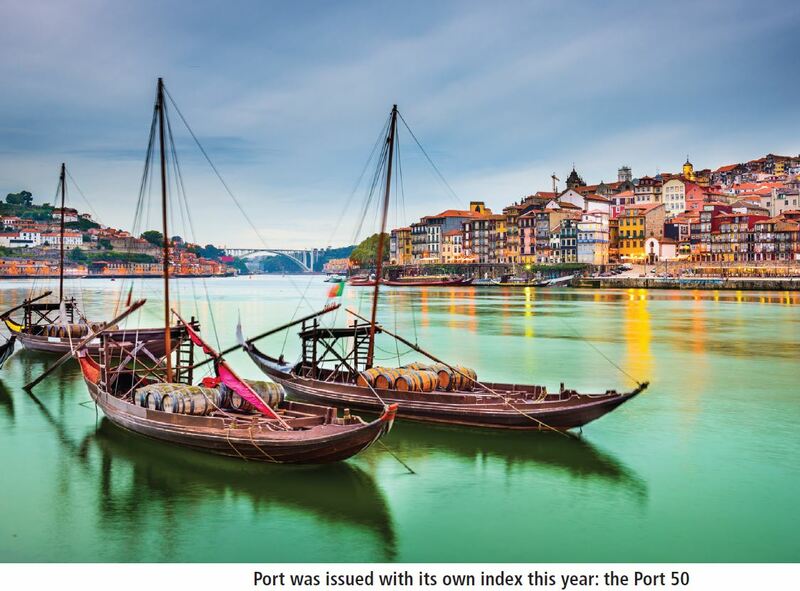 The only other area of interest is Port, which, like California, was issued with its own index this year – the Port 50. To calculate the scores, Liv-ex took a list of all wines that traded on Liv-ex in the last year (from 1 September 2017 to 31 August 2018) and grouped these by brand. For the first time this year, Burgundy labels with both maisons and domaines were combined as one. It then identified brands that had traded at least three wines or vintages, and had a total trade value of at least £10,000. Brands were ranked using four criteria: year-on-year price performance (based on the market price for a case of wine on 1 September 2017 with its market price on 31 August 2018); trading performance on Liv-ex (by value and volume); number of wines and vintages traded; and average price of the wines in a brand. More than 5,700 different wines/vintages were traded on the exchange. These were grouped into 953 brands, of which 248 qualified for the final calculation. The individual rankings were combined with a weighting of 1 for each criteria, except trading performance, which had a weighting of 1.5 (because it combined two criteria). Purely focused on vintage Ports, three of its five components qualified for this year’s list – admittedly quite low down. Warre’s and Graham’s were new entrants this year, while Dow’s – becoming something of a leader among the Symington brands thanks to its 100-point 2007 and critically acclaimed 2011 vintages – clawed its way into the top 200. Collectors tend to sit on Port rather than trade it, as Gibbs noted, which might hinder the sector’s performance, but he says the progress of the new index over 12 years has been steady, if a touch dull. The release of the widely declared 2016 vintage was considered a great success though, proof that Port is still held in extremely high regard. Looking ahead to 2019, it seems like there will be an intriguing few months ahead. Brexit, whether it promises feast, famine or no change at all, is clearly one consideration, although exactly what will happen is anyone’s guess. It might be something for the Bordelais to keep in mind, however. Recent vintages have shown repeatedly that it is the UK that remains the major non-French en primeur buyer. Asia wants back vintages, America blockbusters. As for the 2018s, the noises suggest they are good, and produced in reasonable quantities. If a March Brexit tanks the pound and the Bordelais hike their prices again, they’ll likely be releasing into a void, with the already overstretched négoce taking the strain.